Tth DNA Ligase catalyzes the NAD-dependent formation of phosphodiester bonds between adjacent 3’-hydroxyl and 5’-phosphate termini in double stranded DNA. It is not active against single stranded DNA or RNA and blunt ended DNA. Enzyme is isolated from Escherichia coli strain containing plasmid carrying the Thermus thermophilus DNA ligase gene. Tth DNA Ligase is stable and active in optimum ligation temperature range of 45 – 65°C, which is 7 – 10°C higher than that of T4 DNA ligase. The final reaction ligation temperature is determined by the Tm of the substrates. High ligation temperature eliminates the nonspecific ligation. NAD-dependent recombinant DNA ligase derived from Thermus thermophilus and over-expressed in E. coli. High thermostability allows ligation using high-stringency hybridization conditions. High specificity and stringency permits sensitive detection of SNPs. Up to twenty freeze/thaw cycles will not compromise 10x Tth Ligation Buffer performance. One unit of Tth DNA Ligase catalyzes the ligation of 50% of the cos sites present in 1 μg of bacteriophage lambda DNA in 1 minute at 45°C. 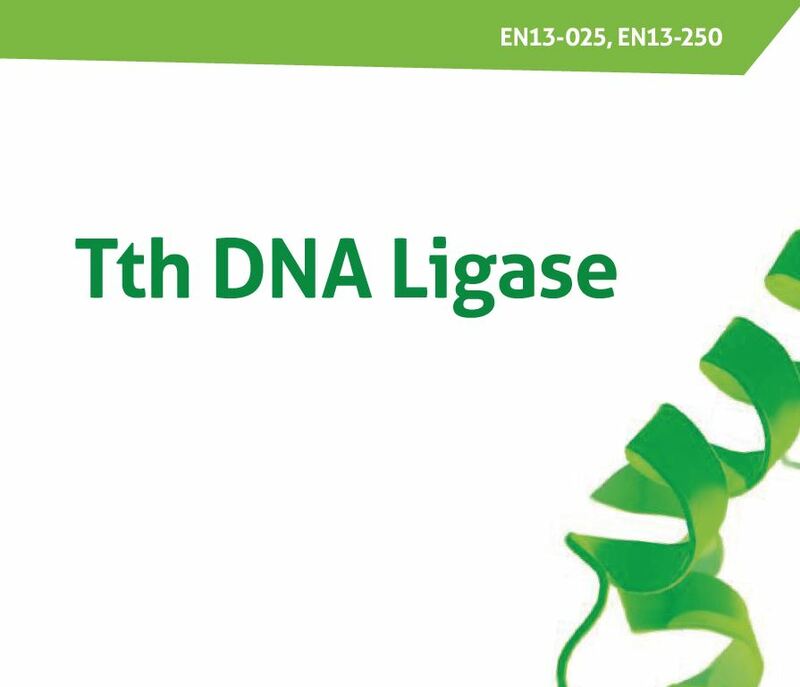 1 U (Unit) of Tth DNA Ligase = 1 Ampligase ® Unit = 15 cohesive end units (CEU). All components should be stored at -20°C. Tth DNA Ligase activity is tested in reaction with bacteriophage lambda DNA digested with SalI and SmaI, with a dilution series of ligase. Results are assayed by agarose gel electrophoresis. Free of unspecific DNA and RNA nucleases contamination.